How did restaurant reviews get into the writing mix? Beth and I like to go out to eat and we do so a lot. We thought that some restaurant reviews might be a good change of pace for the real estate blog, so I started making that a part of the go-out-to-eat routine. Sometimes I’d forget, but other times I’d grab a quick picture and dash off a few paragraphs. This one was about Peggy O’Neill’s, an Irish pub in the old historic part of downtown Palm Harbor. I’m not a huge fan of the Irish pub/pub food concept, but there are times when nothing but a good burger or some fish and chips will do. And when that moment strikes, Peggy O’Neill’s in old downtown Palm Harbor really fits the bill. First, Peggy O’Neill was supposedly a young Irish woman who immigrated from Ireland to America in 1912, expecting to reunite with her fiance and get married. Unfortunately, the ship she chose for her trip was the Titanic. More than 1,000 survived the sinking of the Titanic, but Peggy wasn’t one of them. 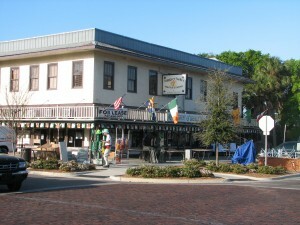 Another item of interest: Peggy O’Neill’s is located in the old Sutherland building at 1026 Florida Ave. in old Palm Harbor, close to Alt. 19. That old building is pretty interesting from an architectural viewpoint, and the old post office trappings have been left alone in what is now the dining room. The corned beef and cabbage is worth trying; so is the fish & chips. I had a reuben sandwich on a recent trip, and that was excellent, as well. One of our companions tried the Shepard’s Pie, and said it was great. Like most Irish pubs, Peggy O’Neill’s is casual and fun. The waitpeople are friendly and helpful, and kids seem to be welcome. There’s live entertainment on Fridays and Saturdays, and Wednesday night is open jam night. This piece was written for the real estate blog. Most of the items posted on that blog were more light-hearted than this one, but we felt that Tampa Bay desperately needs a light rail system. When we used a light rail system in Baltimore while we were on vacation, we were inspired to post this opinion piece on the real estate blog. It got some good reactions, including a nice thank-you from the people who run light rail in Phoenix. Tampa Bay scores again; Forbes Magazine took a look at the 60 major metro areas in the country and then rated their rapid transit systems. Tampa Bay made the list — in last place. That should come as only a mild surprise to anyone who has had to drive to work on either side of Tampa Bay. Traffic here is a nightmare, and there are few alternatives to driving your own car to work. We do have a bus system, but there is no rapid transit system, no subway, no passenger rail. Many of our major roadways started life as sleepy two-lanes. US19N, the major north-south road that runs the length of Pinellas County, was once a rural two-lane road that passed through miles of orange groves, at least in the northern part of the county where I live. Someone recently told me that he remembered when there was just a flashing light at the intersection of 19 and Tampa Road, a busy major intersection today that serves six lanes of US19 and four of Tampa Road. If you want to cross the bay between Pinellas (Where St. Petersburg is located) and Hillsborough (Tampa), you have four choices: The Gandy bridge; the Howard Franklin Bridge; the Courtney Campbell Causeway; and Hillsborough Avenue, the only land route, located at the northern tip of Tampa Bay. If you attempt this crossing in rush hour, be prepared to sit. If you’ve read this blog before, you know I am a fan of light rail, and we might — just might — have such a system in our sights. A month or two ago, President Obama came to town and announced that the federal government would fund the majority share of a high-speed rail line between Tampa Bay and Orlando. That’s nice, because it would eliminate the drive on I-4, a really difficult bit of Interstate between those two cities. But the real value of such a line would be the possibility of a light rail system at this end of it. 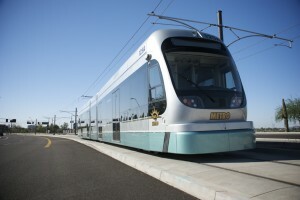 The high-speed line could connect to a light-rail system that would circumnavigate Hillsborough and Pinellas Counties and provide an alternative to the automobile. We have something called the Tampa Bay Area Rapid Transit Authority (TBARTA), which would like to build that system. Clearwater Mayor Frank Hibbard, who serves on the TBARTA board, spoke at St. Petersburg College recently about rapid transit in Tampa Bay, and said such a system is necessary both for current residents and to respond to companies that may consider locating facilities in Tampa Bay. All that said, I do have a bone or two to pick with Forbes about this ranking. We used to live in Washington, DC, and it would be hard to imagine a worse commuting city than that. Before we lived in Florida we lived in Maine, and that meant the occasional drive to the biggest metro center in that neck of the woods, Boston. If you’ve never driven in Boston at rush hour, it is a breathtaking experience. Still, both those cities have good subway systems and buses that run frequently. I think that the very best feature stories are simple ones. I loved this story about a homemade skating rink, and how it bonded two generations of a family. For years I thought this story had been lost, and I was delighted to find it in one of my clip files. WATERVILLE, Maine (UPI) – Kyle Frewin welcomed the new year just as he has every year since he was a kid – playing hockey all night with the neighborhood kids on the home-made rink behind his parents’ house. This could be the final year for the rink, named Frog Forum so many years ago that no one quite remembers why. The New Year’s hockey game that extended well into Tuesday morning could be the last. Kyle, 21, the youngest of four Frewin sons, will graduate in the spring from Gordon College in Massachusetts. His father, Ron, lost his job months ago and wants to sell the house and move to Arizona. If that happens, there will be no more Frog Forum. Frog Forum began humbly, a modest backyard rink banged together out of three-foot boards in 1961 by Ron, who wanted to share his love for hockey with his boys. Over the years, the rink behind the Frewin’s house grew larger. First, it claimed a few trees and shrubs. Then the Frewins made more room by ripping up part of the driveway. Eventually, even Louise Frewin’s clothesline was ripped down to make room for more ice. The Frewin boys grew bigger, and so did the neighborhood kids who skated at Frog Forum. Hockey pucks flew over the boards and into the neighbors’ yards. The youngsters played past sundown, groping for the puck in the darkness. Ron installed six-foot boards to keep the puck on the ice. He installed lights so the kids could play all night if they wanted to. Down the street, a group of youngsters formed a hockey team called the Scummies. Ron turned on the lights, and Frewins and Scummies banged each other happily into the boards. This year, with Kyle in school and Ron suffering from arthritis, Frog Forum almost stayed stacked up in the garage. But Kyle wanted one more New Year’s. The Frewins went to church New Year’s Eve and afterwards, at around midnight, Kyle and a dozen neighborhood kids laced up their skates and started to shoot the puck around the ice. “I went to bed, but I could hear that puck banging into the boards all night long,” Louise said. The oldest Frewin son, Donn, died in a swimming accident eight years ago. Paul is a doctor in Louisville, Ky. Wesley is an electrical engineer in Connecticut. With everyone gone, Frog Forum seems doomed. But Louise thinks Kyle might have other plans. NOTE: This story ends rather abruptly and I think the newspaper editors may have trimmed it to fit an available space in the page. If I ever find a complete version of it, I’ll add the missing paragraphs.